GET YOUR PERSONALIZED "ADVENTURER'S ALTAR": Let your world travel tracker show-off your breath-taking adventures! Brighten up your living-room, bedroom or office and make your guests' heads turn as you start up a lot of great conversations! NEWLY DESIGNED TO SUIT YOUR TASTE: The purity of the design and color differentiation for each state makes everything perfectly clear. With such a useful suite of accessories, ebooks, glossy layer, infographics and top customer care, this scratchable map is just the best. 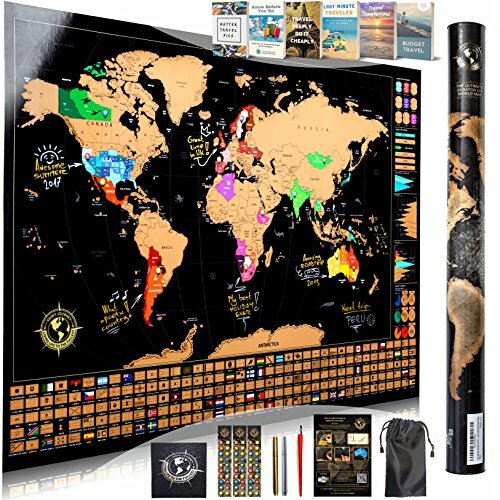 EVERYTHING YOU NEED & MORE: This thick laminated wall scratch-off map edition comes with a SCRATCH TOOL + two erasable PENS + a CLOTH + 3x20 STICKERS + a POUCH + a MANUAL + free access to our VIP EBOOK zone. Everything is protected by a beautiful, sturdy tube. A GIFT WITH A TWIST: Don't know what to get for someone that's got the wanderlust? Even for friends and family that don't travel alot, our black globetrotter map strongly motivates everyone to visit new places. This is what makes it the most useful and original surprise that you can get for anyone! QUALITY YOU CAN TRUST: Hapiness of our customers is our mana! This is why we go the extra mile to make sure you get nothing but the best. We are really passionate to see your satisfaction! Order with confidence knowing you're making a risk-free investment. If you have any questions about this product by Shiny Journey, contact us by completing and submitting the form below. If you are looking for a specif part number, please include it with your message.